We’re back, and you’ve joined us in time to take a look at the last of the Series 5 Friends Animals Collectibles. Things are wrapped up with today’s featured animal, the Brown Bear. Taking a close look at the model, the background and foreground graphics do a great job of concealing just how small the set looks. The bear is also taking a back seat to the whole thing, being overshadowed by the leaping fish (assumed to be a salmon). Once again the alternate build is pictured at the back. The assortment of parts is far more pedestrian in this set, although we do have a small handful of Medium Azure elements typical to the Friends theme (and formerly Alien Conquest). A couple more small plant parts in Green are one of the things to look forward to. 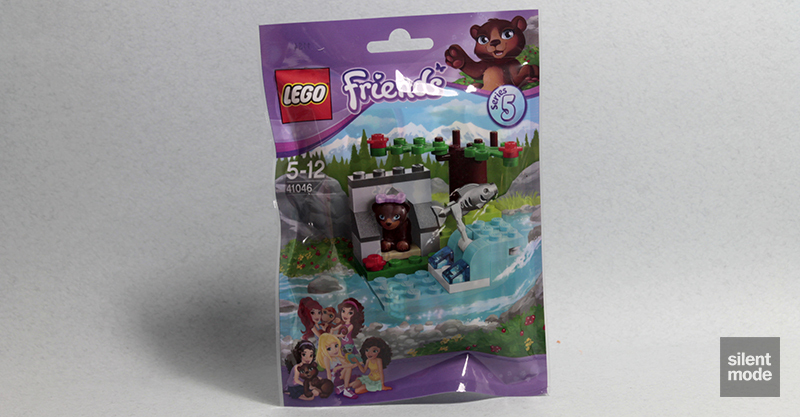 A bear was to be expected in the Friends theme, and this is a new mould introduced by this sixth wave of Friends. This one is in Dark Brown, and I believe there’s at least one other variant in this wave in Dark Stone Grey . Very sensibly it gets the bow on top of its head, and not on its back like some other animals. The eyelashes and choice of Lavender bow suggests this bear cub is female. As with Orangutan’s Banana Tree, there’s only one thing to build in this set: the vignette of a river bank. The Medium Azure 4×6 plate highlights the construction of the base, held together by a couple of 2x bricks. The Tan 2×2 jumper plate serves as a placeholder for the bear inside of a makeshift cave, while another tree (albeit much smaller than in previous sets) is constructed in the background. The rest of the Medium Azure parts are used to create a waterfall. A White droid arm and this Metallic Silver fish join forces to make a very simple mechanism to simulate the fish swimming upstream. It attaches to a 1×2 plate with bar we used to construct the waterfall. … Fortunately I have a spare in my collecton. Bad bear! Bad bear! Go to your room! That’s more like it. The Brown Bear sits patiently in its cave, studying the movements of the wild salmon as it completes its upstream pilgrimage. One day, when it is fully grown, it will master the art of cutting unsuspecting salmon’s journey short. A salmon misjudged its trajectory. Quick, now’s your chance! Another tactic the bear can use is waiting until the salmon makes it up the waterfall and tires itself out, before moving in for the kill. This scene is a lot more tranquil, and can be fairly easily built without the instructions (found on the LEGO Friends website). By far the most generous helping of leftover parts in the series, including the spare Lavender bow. 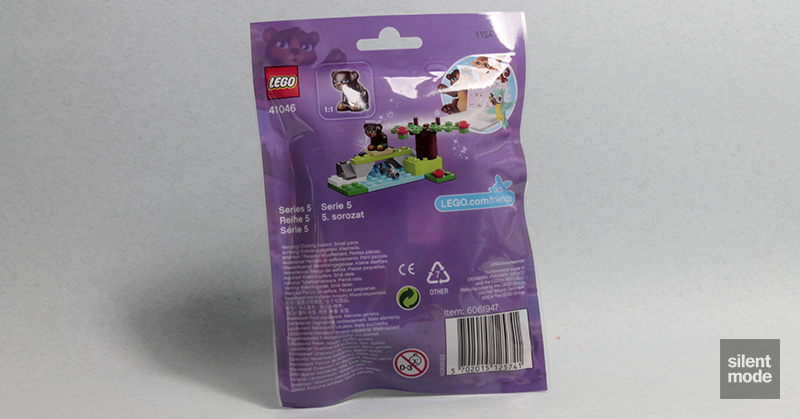 Of the three Series 5 sets, this one appears to be the best all-rounder, even though it only makes use of Medium Azure from the Friends palette (not including the Lavender bow). In fairness, the natural great outdoors wouldn’t make much use of those bright and girly colours. The vignette would fit very nicely into a corner, and would make a nice little display on a workplace desk. The fish swimming upstream makes for a little distraction, though not so much as the swinging orangutan – if there was a way it could be motorised to tell the time, that would be cool! The bear is my second favourite of the animals in the series, with the macaw’s use of Medium Azure winning me over. That said, I prefer the brown bear in the City theme. I’m giving this set 5.4/10, and here’s hoping there’ll be a sequel, where the grown-up bear has a street fight with a John West fisherman.